Directions: North at road crossing the trail, then right. Can't miss it! That is sad. I stayed there when I rode to my folks house in O'Fallon a couple of years ago. It was a fun experience, and the breakfast sandwiches were great. This is terrible..Peer's has been a popular trail stopping point for several years. A new 12,000+sq-ft K&R grocery did go into full operation in Marthasville last year. A dollar store was already there. This grocery in not next to the trail. But it could easily draw local food business. That's too bad, I've always enjoyed stopping in there if for nothing else than another snack and soda or water like I already had in my handlebar bag. They will be missed, pleasant people are one of life's premiums. We need more of them not less. To say "another one bites the dust" sounds callous, but... In the past couple of years along the trail several businesses have closed, taverns, B&B's among them, and now the Peers Store. WE, the Katy Trail people, are part of the mix of clientele that keeps these small locally owned businesses alive and hopefully growing. I won't go into my "buy local" buy "Made in the USA" rant, but for some of these businesses their existence is, at times, tenuous. To be mindful of the impact we can have on the businesses along the trail, could help them and in turn help us, by them being there. Sometimes when your headed out to the trail, pass up the "MegaMart" and patronize those that depend on your business, they 'will' miss you. In case you are wondering, I don't own a business anywhere, and really, there is only one business on the Katy Trail whose first personal name I know, and that is Dotty. This is the 2nd such spot on the KATY that closed in less than a month. I agree we MUST support those on the trail if we expec to see them next time. Barb and crew will be sorely missed. This is a piece of living history that can not be replaced. What we see happening is a micorcosm of what is happening to our USA. So keep going to Chinamart to support slave labor and eco destruction, not to mention lack of safe labor practices. China continues to send poison to our shors with not so much as a peep from those who are supposed to protect us. Nuff said. The Peers Store is now the Katy Land Trust. It's open seasonally noon to 4. There's an ice cold soda machine on the porch if the store is closed. Not a lot inside, but a good place to get a drink or ice cream bar. There's a little gift shop and some art. Supposedly there's music on weekends, but nothing going on when we were there at noon on a June Saturday. So it's no longer a real store, but it's a good place to take a break. May 2011: Once again Barb proved out to be a positive part of the KATY Trail. We had a hard soggy ride from Washington which I do not reccomend for anyone to do. I will not do it again! The traffic is heavy and the bridge is super narrow.. Anyway Peers store is a must stop for anyone. Thank you again Barb for being there. You are truely a wonderful hostess. June 20, 2010- Peers Store was our first stop on our journey to ride the entire Katy Trail from St. Charles to Clinton. Barb was the sweetest hostess and treated you like family! Accommodations were above the historical store that has been in the family throughout a few generations. The rooms were clean and comfortable. Since we were traveling light, we needed to hand-wash our biking clothes each night; Barb had the perfect setup to line dry your clothes overnight and to my surprise they were dry the next morning. Barb told us to make ourselves at home; this was a great help as we were able to use her freezers to freeze our 9 water bottles for the next day’s ride. The next morning Barb made some fabulous breakfast sandwiches which we enjoyed while visiting with Barb and the regular customers. We highly recommend PEERS STORE and will most definitely spend the night again. THANKS BARB! Oct. 4/09 Peers Store is a must stop for any who appreciate history, hospitality, and the out of the ordinary. Barb is one fantastic hostess. She and her store bring you back to a time when a handshake was better than a contract. Her culinary skills and last minute flexability saved us from a sure night of hunger for want of real food. The dinner plans were formulated via cell phone as we headed West. We had been pedaling all day against the wind and seeing the store to the North of the trail was a very welcome sight. Do not expect Hilton accomodations but the ambiance experienced is not found a Hilton either. 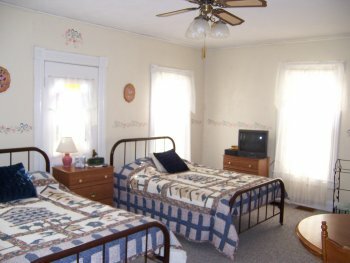 You will enjoy the clean warm rooms and breakfast with the "regulars" is a plus also. Thank you Barb for a great stay. We will be back if you will have us. Barb is a life saver. After a very long day in the rain we enjoyed her hospitality. You couldn't ask for a better place to spend some time. I recently stayed 2 separate nights in the room above the store on a round trip...Barb and Amy were very gracious and the $45/night rate kept me within my budget...the breakfast sandwich was a great way to start each morning...I highly recommend it!! They have lunch specials too which are very good and very inexpensive. I highly recommend them! I spent the night at the store this past week with my son in one of their upstairs rooms. My main attraction was the affordable price that offered shelter, a soft bed, air-conditioned comfort, and a sandwich to start us out the next morning. I am thankful for the kindness that the whole business showed us, plus we were able to get a ride to the next town because we took on more than we could handle when my son and I started out on this wonderful bike trail. Thanks to Barb for her hospitality and service. P.S. I offered money to the gentleman who drove us back up the trail on that rainy Tuesday. Yes I love that place! I recently stopped in again for lunch and got the special which was Green Beans and Sausage...and inexpensive and delicious! They were warm and friendly people, and the store is a neat time capsule to browse about in and get supplies. I'm planning to try an overnighter there soon. My ABSOLUTE favorite establishment on the entire KATY Trail! The ambiance, the service, the accomodations, the history....all represent a time when life was much simpler. If your ride takes you to or through this area, DO NOT pass up the opportunity to experience this true slice of Americana. I agree! It's like going back 50 years in time! I agree on your comments about Peers store. I found the place while looking for lunch and a place out of the rain in May this year. Soup and a sandwich and what appeared to be most of the neighbors in the area. I would recommend this stop to anyone riding the trail. (pass on the coffee). Sounds like a place to visit on my trip this month. Where is Peers? I don't see it on the map. It's between Treloar and Marthasville. Here's a web page with Peers info. If you visit the store, be sure to ask about the flood of '93 - some interesting stories. Very nice people, offered pork-burger platters during the DRN trail ride. It's definitely worth the stop. The folks at Peers were very helpful to me for my recent overnight stay. I felt welcomed, trusted, and appreciated. A word of caution: the accommodations are spartan. The old-timey bed and squeaky ceiling fan were bothersome, but I put my sleeping bag on the floor in front of a box fan and slept like a baby. I didn't turn on the TV in the room, not even to watch the one movie in their video collection. The bathroom was the most unimpressive - a tub with a hand sprayer, not much water pressure and not much hot water. You aren't allowed to flush your toilet paper because it will clog up the pipes. But with all that said, if all you need is a place to sleep and a breakfast sandwich, do you really need to spend $60 more for a B&B? We did not spent the nigth at Peers store on our Katy ride last month, but we did eat lunch there (very good), and took a look at the room. We plan to stay on our next trip. Look, this place is decades older than ANYONE riding the trail, so they may have issues with the piping and/or septic system. If you've been on a mission trip to a third world country, not flushing your potty paper is no big deal. If you want a mint and USA Today, stay at the fancy hotels in St. Louis. If you want to experience a bit of history stay at Peers Store! Ditto Peers store as a must stop on the trail. I pulled up there on a 90-plus degree day in late July this summer and was welcomed like an old friend. Well worth the stop and stay overnight if possible. I wasn't going on a mission trip to a third-world country, I was in Missouri, where I'd like to flush a big wad of toilet paper. It wasn't a problem for me, I didn't have to go. But I didn't see any comments here about what to expect, and I figure I'm doing other trail users a favor by telling them how it is. Looks like there's some pretty fancy hotels in Marietta, too. Peers Store was awesome. It's a railroad era building with a ton of history. Barb, the owner, operates a small grocery store. In addition, she has a room above the store which she rents for an extremely reasonable rate. A friend and I stayed overnight on 10-16-2008. Brittany, the young lady behind the counter, has a fantastic personality. Barb could not have been more accommodating. She and Brittany are, without a doubt, the friendliest people on the trail. We ate lunch at the Peers Store. The young woman made us a sandwich that was almost too big to eat. The picnic table outside was covered with a camouflage net that made for a pleasant place to eat. They're good people and it's a good place to stock up on snacks. We stopped here for lunch on our way to Tebbetts from St. Charles. The young girl that was working was very helpful and gave us everything we wanted. The room upstairs has 2 beds and can be reserved for $45 and the room next to it for another $5. We plan to stay there on our next trip. Definately worth the stop. hospitality at a reasonable price, do not hesitate to book with Barb. While riding the trail we accidentally left a cell phone outside the Peers store. Barb found it, went the "extra mile" to track us down and even drove to the next town to deliver the phone. She is very kind and would accept nothing in return. Please patronize this store! Thanks again. Had lunch at The Peers Store last week. The "price fixee" was five bucks, and included seating at a shaded picnic table and a water bottle fillup. What more could I ask for? If you stop in, be sure to check out the flood pictures on the dining room wall. Very Impressed! Called Barb late on Friday night and she accommodated room for two within the hour! Best deal on the trail. Room was fantastic, breakfast good, and access to store at all hour terrific. Make this a stop for your overnight lodging needs. Barb and Amy are the best - easily the favorite of me and the children for overnight accomodations. Friendly and genuine! Just finished 5 days, 200 miles, from Sedalia to St. Charles. Oct. 15 thru 19th, 2005. All went fine, only 1 flat, on Raleigh Touring bikes with 700x38 tires. We are 64 years old, and averaged about 45 miles per day. All plans were arranged from the BikeKatyTrail site. PEERS STORE, owned by Barb, is outstanding in all ways. Nice room, exceptional food, helpful, and priced right. Locals are fun to converse with also. Only bath needs some updating and Barb is working towards that. RENDLEMAN'S B&B has very good food, (dinner and breakfast ). Doug is also an avid biker, cook and easy to converse with. HARTSBURG INN owned by "Cath", very clean, with in room TV, Microwave. Locate right at trails edge. Have photo's of lodging and will gladly converse on helping with anyone planning a trip. This B&B was at just the right spot after biking 80 miles on that day. Supper was pot roast with carrots, potatoes and acorn squash and a salad. It was tasty and we were starving. Breakfast was French toast with fresh peaches. The sleeping rooms were upstairs and the bathrooms were downstairs. Our room was small, clean, spartan and air conditioned. Doug is a very interesting host. Had a lowly P&J at the Peers Store and it tasted like a 5 course meal after a long, hot ride. If I'm on that section of the trail again I will surely stop there. Do you have a vendor in your store that sells home grown pecans? If so are they available? Thanks for your time. Mary. Have a great day!!! Yes Peers Store will have a limited supply of pecans available soon.